Near a turning point or ready to march higher? For the last few months we had countless pundits call for a pullback in the markets, yet the indices have continued to head higher in the face of this cynicism. As I have pointed out earlier, it is this very cynicism that provided the fuel for a sustained move higher. But that was then and this is now, so where do we stand today? All good things come to an end and our current rally will be no exception, so the question is if the markets are ready to rest and refresh after one of the strongest first quarters in more than a decade? I don’t have any quantitative data to back this up, but it sure feels like far fewer talking heads are claiming we are on the verge of a pullback. The strong surge higher has humbled anyone who tried to stand in its way and the cynics are giving up after taking more than their fair share of lumps. And for the individual investors, it seems like the small sample of other traders I’ve talked with are very excited about their portfolio and think selling and locking in profits at these levels is crazy because there is more upside left in this move. Both of these are highly subjective measures, but it does hint that market participants are getting as bullish as they have been in a long time. One way we can quantify this complacency is by the unusually low VIX, resting near 5-year lows. The interesting thing from the chart is every time we got this low in the last 5-years, something happened to push the VIX much higher. 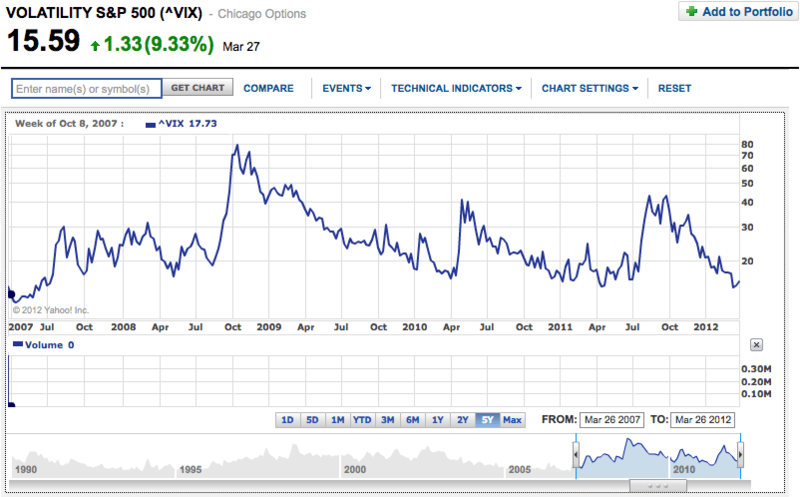 But countering this, we did see VIX levels far lower than this during the 2004-2007 bull market. So like every other indicator in the markets, this one can go either way. This might be the calm before the storm as it has been over the last several years, or it could be the start of a new market phase of low volatility and an appreciating market. And of course this doesn’t have to be an either/or proposition. We could very well see a bump in the VIX in the short term and then have it settle back down at these or lower levels once the anxiety passes. But back to the complacency, how this affects the markets is all these bulls are already fully invested and are nothing more than spectators at this point. From here it will take new money to continue pushing the markets higher. So far a lot of that has come from former skeptics who changed their mind and started chasing the market. But at some point we are going to run out of chasers and that is most likely when the upside move will peter out. No doubt bad news could send us lower, but it feels like the market is no longer obsessing over headlines, so it will take something else to bring the market down and we stand a good chance of turning down on good news simply because we ran out of new buyers to push prices any higher. There does seem to be a lot of money watching this rally from the outside, namely in the bond market, and that could easily push equities higher, but I think this is a longer term story. Anyone still hiding out in bonds will need a bigger kick in the pants to move. We might be seeing the start of this as bonds have been falling and stocks have been rising. But, no doubt there is a lot more to come. It is impossible to give a definitive answer about the timing of our next pullback, but the end of the quarter might just be that catalyst. Currently many money managers are behind this rally and that has forced them to chase all the way into quarter’s end. But with a new quarter, they will have more breathing room and that will allow them to shift strategy from chasing to something else. What that something else will be is anyone’s guess, but it will probably involve more selling than we have seen so far. Anyway, these are just my guesses on what other market participants are thinking and what that means for the market. As always, only trade what you feel comfortable with.